Gifts For Holiday's and Special Occasions! Country and Victorian Christmas décor. Pillow with matching bottle (with pin cushion top), mini pillow and magnet. Snow white lace background, double white lace border with glitter, double red cross bars, white flowers and red and white ribbon. White lace background over white. 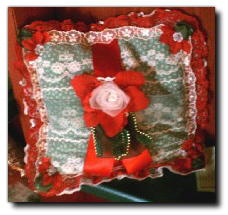 Green and white lace border, crossed by red satin and satin and white lace, and red and green ribbons. 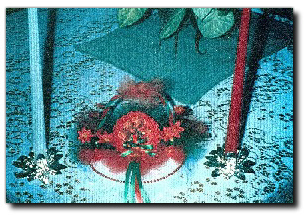 Star Bud can be worn as a Christmas corsage or left on the pillow. 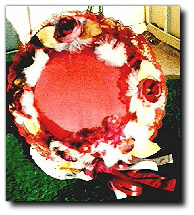 Medium Victorian hat covered with snow flowers under them, gold leaves and burgundy and white streamers. 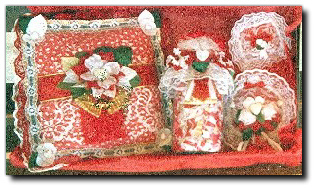 Country Christmas decor set with bottle (with pin cushion top), mini pillow and magnet. 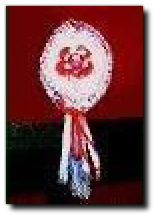 White lace background, double white lace border, red lace on the center circle and red and white flowers and ribbon. Red velvet background with wide white lace band across, red and white flowers, holly leaves and red and white lace border. 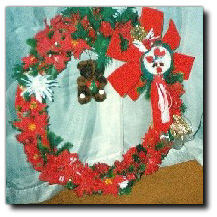 Large country and Victorian Star Bud wreath made with pine branches, red poinsettias, white snow flowers, large red velvet bow and a teddy bear hanging in the middle. The Star Bud can be worn as a Christmas corsage or left on the wreath. Large country and Victorian décor snow pillow. 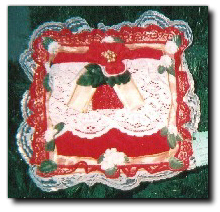 White lace background, double white lace border with gold and green ribbon banding, red velvet ribbon in center with red and white poinsettia with a red jewel in the center and red and white ribbon in the corners. 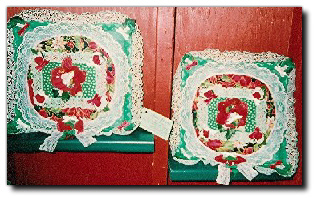 Country décor pillow twin set with patchwork background, double white lace border, center square with white lace around, red and white flowers and a white lace streamer. Medium country Star Bud wreath. Made with red, green and white taffeta bows, red flowers and gold beads wrapped around. 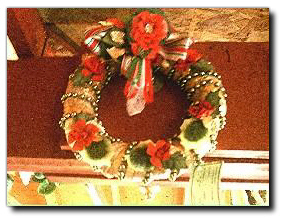 The Christmas Star Bud can be worn as a corsage or left on the wreath. 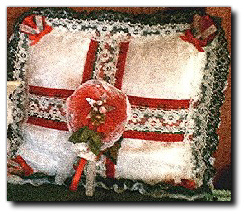 Victorian decor Star Bud pillow with bottle to match (with pin cushion top), white frosted lace background, silver and white ribbon lace banding, center white lace Star Bud floral Christmas corsage with red, white and green streamers. 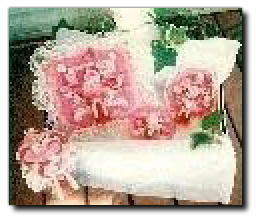 Corsage can be worn or left on the pillow. Country and Victorian décor pillow. 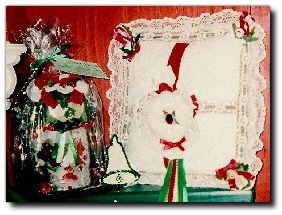 Green velvet background whit white lace overlay, red and white lace border, center white rose with red poinsettia, red satin ribbon, green and gold ribbon with bead trim and red and white flowers and holly leaves in the corners. Large Country and Victorian frosted snow pillow. 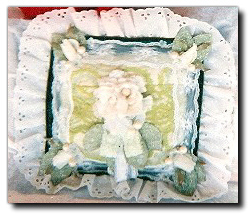 Double white eyelet lace border, green velvet background overlaid with white lace, green frosted leaves and white flowers, white lace streamer and pearls in the center. Country and Victorian Christmas centerpiece with red and white candles and holly leaf and white trimmed metallic candle holders. Red and green glitter Star Bud Christmas corsage with red and green streamers, round white lace base with gold beads. 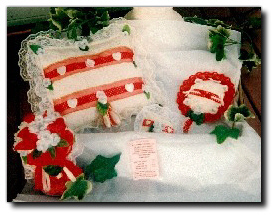 Country décor 4 piece pillow set with matching bottle (with pin cushion top), mini pillows and magnet, red lace bands with double white lace border, red and white flower and holly leaves in the corners. 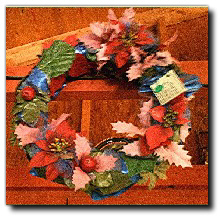 Medium old English Christmas wreath wrapped in blue frosted ribbon, red poinsettias with gold centers, mauve holly leaves, and blue bow on the side. 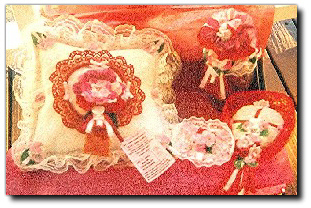 Country décor pillow set with matching bottle (with pin cushion top), mini pillow magnet. 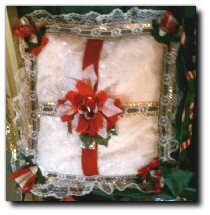 Country design background with white lace overlay, white and red lace border with green and white lace ribbon band, center red glitter band across, white and red lace border, green and white lace ribbon band with gold trim, white and red poinsettia, double gold ribbon streamers and flowers in the corners. Red satin one pound box of assorted chocolates. 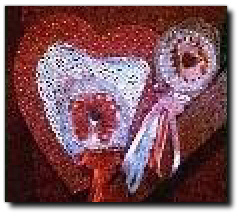 “To My Valentine” in upper right corner. Lilac floral Star Bud corsage comes off to be worn on Valentines Day and for many other uses. A twin valentine décor pillow set with gold metallic white lace border. 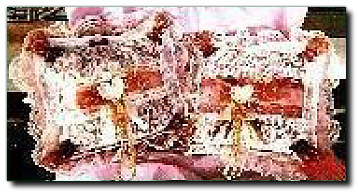 Two inch white lace inner border, background five layers of burgundy and pink velvet with lace overlay, center burgundy and gold metallic bows with gold beads and gold sequined streamers, crystal hearts in center with white pearls around, burgundy flowers in corners with gold loops. 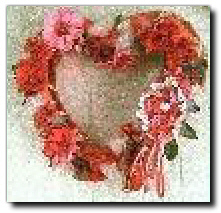 A large valentine heart grapevine wreath. Pink, white and red assorted flowers and greenery. Star Bud corsage comes off to be worn or left on the wreath. 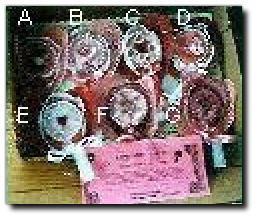 Seven valentine star bus corsages with assorted pearls and jewels in the center, double pink and white lace borders and streamers. 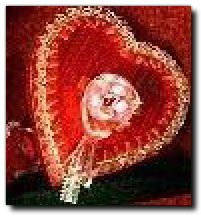 Red satin one pound valentine box of assorted chocolates. 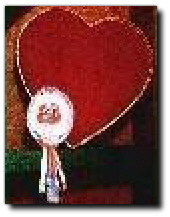 “To My Valentine” in upper right corner. Pink and white star bud floral corsage comes off to be worn on Valentines Day and for many other uses. 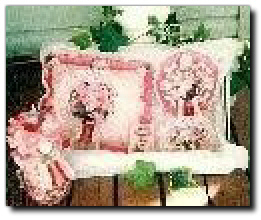 Valentine four piece décor pillow set. 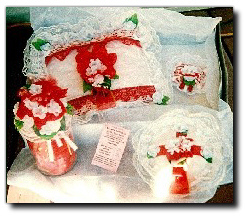 Pillow is white lace background, double gold and white lace border, red and white circle lace in center with pink and white flowers and pink and white streamers with matching bottle, mini pillow and magnet. One half pound Valentine box of assorted chocolates. Pink and white floral star bud corsage comes off to be worn on Valentines Day and for many other uses. A pink and white star bud sits along side the box. 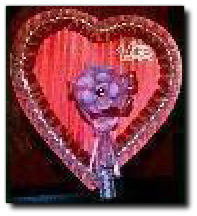 Valentine splendor four piece décor pillow set, pale pink and dark pink lace border, pink lace overlying white velvet, lots of pink and white flowers all over, dark and light pink and white streamers, matching mini pillow, magnets and bottle with white pearl hearts. Red satin one pound valentine box of assorted chocolates. Red and white floral star bud comes of to be worn on valentines day and for many other uses. 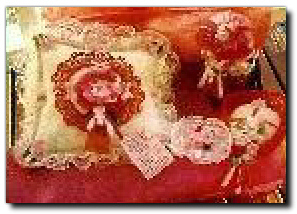 Beautiful valentine four piece décor pillow set, two inch metallic white gold double lace border, pink velvet with dark pink lace overlay, center design white lace with dark pink netting, pink and white flowers and pale pink ribbon, matching mini pillow, magnet and bottle. 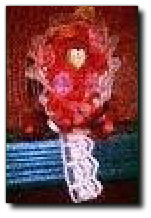 White lace around the outside with red netting and crystal heart jewel in center with red and white ribbon and white flowers. Star bud floral corsage can be worn or have many other uses. Floral star bud corsage to be worn or many other uses, red and white flowers with pink and white netting overlay and red heart jewel in center with white lace border.